The functional inspiration for the cufflinks came from a rouge powder container that had a lid with a sliding function. I thought it would be interesting to use that specific function in the cufflinks. The look of the cufflinks was inspired by the porthole on a ship. I found it very masculine, but still simple and a little mysterious. The cufflinks are made of 18 carat white gold and the five black diamonds are supposed to imitate the bolts in the porthole. 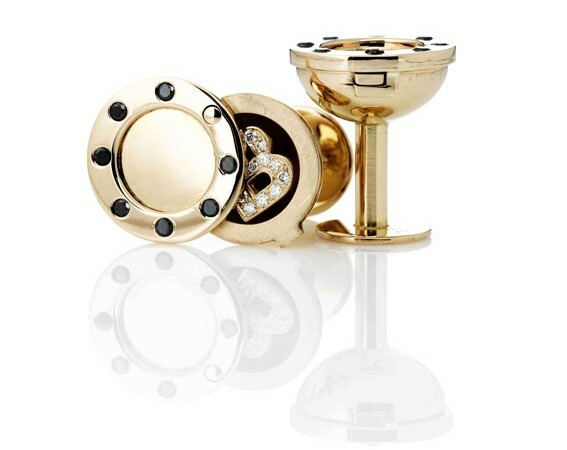 The idea of having a simple exterior design and a hidden treasure in the inside appealed to me, so I designed the cufflinks with a hidden space to hold the owner’s initials in 18 carat gold and covered with diamonds. The Cufflinks are made of 18 kt. gold and set with black diamonds on top and white diamonds on the B.